Give your precuts a happy home—in a quick quilt! 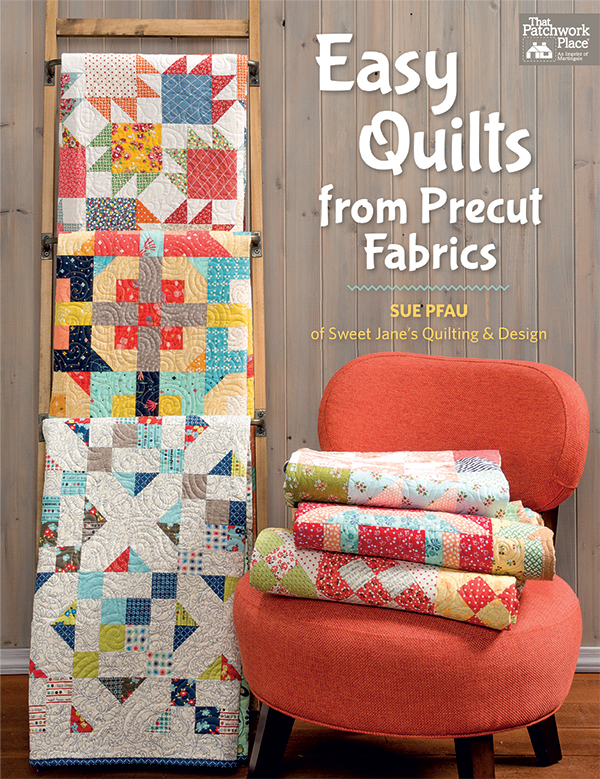 We’re SO excited that Sue Pfau’s third book, Easy Quilts from Precut Fabrics, is finally here! Sue’s whipped up gorgeous quilts featuring classic quilt blocks—and you’ll get to the finish line fast using time-saving precut fabrics. No need for stockpiles of scraps; all those small cuts of fabric in a precut bundle make it easy to coordinate colors and prints. Simply pick your favorite precut: Layer Cakes, Jelly Rolls, or fat quarters. Just one or two precut bundles plus a background fabric are all you need to begin sewing these beauties. And you know if it’s from Sue, it’s economical too! She’ll help you make the most of any precut bundle or scraps you have. We invited Sue to be our guest writer at Stitch This! today so she can tell you more about her latest book. 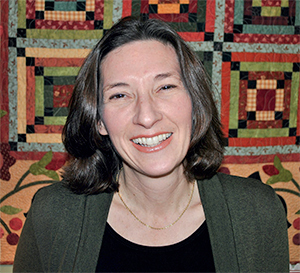 Welcome, Sue! Quilters who know my work know that I like “easy.” I’ll make no excuses for that! But as my tastes and interests have changed through the years, I’ve started to take more of an interest in vintage quilts. The problem is that when I look at antique quilts, they are way too time-consuming and complicated for me—you could even say intimidating. In Easy Quilts from Precut Fabrics, I wanted to design quilts with vintage elements and appeal, but also quilts that would be quicker and easier to complete. I love to use precuts. I have always been color challenged, and ever since I started using precuts, my quilts have turned out so much nicer! The designs in the book require one or two bundles of precuts plus one background fabric. This makes picking out fabric quick and uncomplicated. My cutting directions are simple and easy to follow as well. I’ve also included some tricks I use for color placement and for picking out background fabrics. I hope these suggestions will answer some of your questions about using precuts. You’ll find that the designs in my book either have no border or a very simple border. If you are anything like me, after I get the main part of the quilt top done I just don’t have the energy to put together that border. I have a UFO that has been sitting in the attic for 12 years for the mere fact that I was too lazy to piece the border. You won’t have that problem with any of these quilts! Unintentionally, each of the quilts in the book has only one repeated block. I suppose this appeals to my simple tastes! I like it because it makes the blocks easier to piece; you can get into the groove of putting blocks together without constantly referring to the directions. Another benefit of a one-block design is that you can change the size of your quilt on your own by making more or fewer blocks. I love that. One last point. My quilts are scrappy and they can all be made with fabrics from your stash. Please don’t think you need to buy precuts to complete my quilts. I hope I’ve inspired you to get busy sewing, and I hope you have as much fun making these quilts as I did! Sue, thanks for introducing us to your new collection of precut quilts! Which precut bundle would you love to use in one of Sue’s quilts? We’ll choose a random winner one week from today and let you know by email if you win. Feeling inspired to untie the ribbon on a fat-quarter stack or Layer Cake or unfurl a Jelly Roll right now? Order Sue’s new book at ShopMartingale.com and you can instantly download the eBook for free. I have a jelly roll to use, and I have a fun stash, so I would make more than one! I have lots of layer cakes, so I would start with them. A FQ bundle! Great quilts! Layer cakes have become my precut of choice lately so I would use one of them! I would use a Layer Cake; love that size of pre-cut. This book looks perfect, no borders is just my style. Thanks for the chance to win a copy. I really need some good ideas to use up my many fat quarter bundles. They are my favorite precut. I think I’d go with layer cakes because I have some that need a home! These quilts are absolutely stunning! Thanks for this opportunity. I have some jelly rolls that I need to put to good use. I love hove delicate they appear in the big picture. I love them all but if I have to choose I think Layer Cake would be my first choice. I would use layer cakes. Love the vintage bear claw quilt! While I love jelly rolls, layer cakes & fat quarter, I chose my own fabrics because if I don’t, my house will look like the cartoon of the house bursting at seams with fabric. I have a lot of layer cakes that would make a pretty quilt so I’d have to choose that. I’d love to fussy cut them. A fat quarter bundle. I love the echo churn dash quilt. I collect fat quarters so I would choose those first and then head to my scrap stash. Love the colors and patterns in this book! I have a big stack of jelly rolls. I need this book! It’s so hard to choose! I guess fat quarter bundle wins out though. I’d use a fat quarter bundle or my scraps. I would like a layer cake or a fat quarter bundle! I love the blues and yellows! I’ve been making a wall hanging using my fat quarter bundles and I’m almost out! I have a layer cake I would love to use. I have a fat quarter bundle just waiting for me to make the Churn Dash Echo! I was gifted a stack of Christmas Fat Quarters (200 of them!) purchased in a clearance sale by a friend. Would love to use them on a few of the quilts in this book!! Thanks for the chance! I’d use the nearest thing I could get my hands on from my stash. But most probably a jelly roll. I have a few jelly rolls that could be used, but I also have lots of scraps. It’s a toss-up! While I have a couple each of the precuts, (ok maybe a lot of fat quarters) I have lots and lots of scraps so I’d try to use those first. Probably scraps because they seem to multiply when I am not looking. I am grabbing a fat quarter bundle to make the churn dash echo. Vintage quilts are my favorites! I have a jelly roll itching to be used! I would use any of my precuts to make one of her quilts. I have a few of each of each precut. The quilts look wonderful. I would do a quilt using my fat quarters and another quilt using one of my jelly rows. I have jelly rolls and a layer cake…well and charm shares. Oh heck, I have them all! All the quilts are great! I love fat quarters!!! I like big blocks and I cannot lie! A jelly roll cut w/a special ruler to get those flying geese! Jelly Rolls or my own scraps will be used by me with her patterns. I’d use a layer cake. Especially now that I’ve seen that Vintage Bear Paw quilt! I can’t wait to make it!! I have a FQ bundle I’d love to make use of. Have a few layer cakes, and oddball charm packs, making a scrappy quilt could be fun! Have always wanted to do a churn dash. Would love to use her book with a fat quarter pack. Quilts are so refreshing! I would choose my scraps. I have lots of them and love that scrappy look! I would use scraps from my stash because I have so much of it, but it is nice to have books that use pre-cuts. I teach quilting and a lot of my students buy them and that makes my job easier. I would like to be friends with Cindy M’s friend up above that got the 200 fat quarters for Christmas. What an awesome gift. 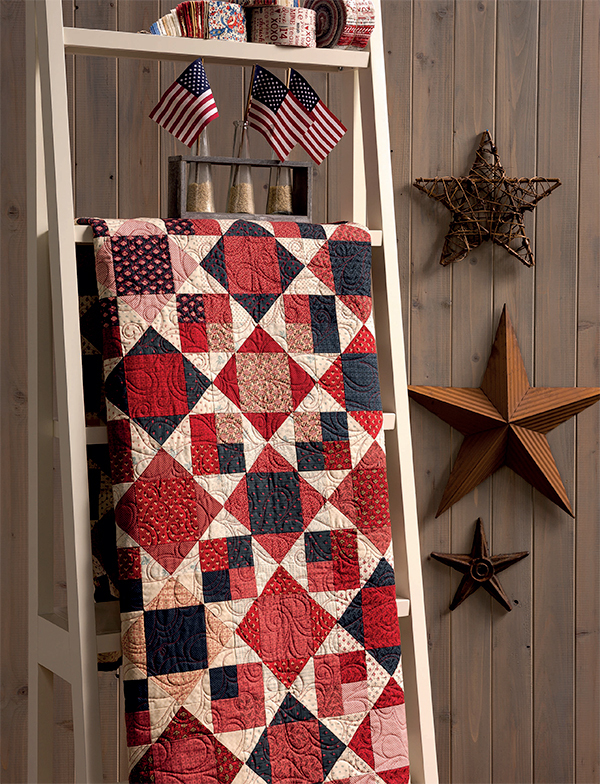 I love the quilt "The Fourth of July". It would be fast to make up and is so cute. It would be cute in shades of blue. Thanks for the chance to comment on the book. I have lots of jelly rolls that need to grow up to be quilts – this book would make that much easier! Love the designs. I would go with jelly rolls. I have a couple and need some new ideas. Layer cakes, fat quarters and scraps! I would use them all. Nice book! I love scrap quilts and I am very good at buying fat quarter bundles and then not knowing what to do with them! A fat quarter bundle. Beautiful quilts. Thanks for a chance to win. Sounds like my scraps could use this book since I have so many. I do have several jelly rolls that would work also. I like to use fat quarters. I have a jelly roll that is begging for a project to come along! I love all precuts but for Sue’s I think I’d like to use a jellyroll. I love using Jelly Rolls! I have so many scraps, I think I’d try to use my scraps! I love using pre-cuts mainly because you don’t have to press the fabric before cutting. I like all of them but choose jelly rolls as my favorite. I seem to have collected a few layer cakes and haven’t used them. Need some good ideas! FQ are my weakness, I love trying to match up an assortment of colors and patterns. I love jelly rolls with the wide variety of colors within. Fat Quarter Bundle! I feel like that size works well for me and with many pre-cut designs! I love fat quarters! They offer the most flexibility so I’d use them and then dig into my stash and scraps! I need to use up my scraps. Does that ever happen? Thanks for a chance to win! I would definitely use any and all scraps to make one of these quilts! I just love the look of a scrap quilt coming together. I am ready to use some jelly rolls! I have two Jelly Rolls that haven’t found a place in the quilt pile. But then there is that bundle of fat quarters still tied together. Of course, my stash is in a serious need of being busted. I guess I could make one of each pattern in the book without going to the LQS! I don’t even know how to answer that question as I have waaaaay too many of all of the above. I’ve been looking for some really good precut patterns, and I think Sue’s new book will definitely be on my birthday wish list this Friday. If I had to choose, I think I would start with my fat quarter bundles first. Or maybe my new Kaffe layer cake. Too any choices. I would use a fat quarter bundle along with scraps. Thanks for this awesome giveaway. If I could get my hands on Japanese fabric layer cakes, I’d jump right in! I am a layer cake kind of gal – I feel that they give me more options for using different patterns. Another great book by Sue. Love the Churn Dash for burning some of my fat quarters. (So I can buy more…..) I also have three or 4 layer cakes that I’ve been waiting to use. I love fat-quarter bundles. So much fabric. So many options. I would love to use the layer cake. or the jelly roll bundles. They seem perfect for jelly rolls. Of which I already have more than I can use in this lifetime! Love them!! I have SEVERAL layer cakes that would go WONDERFUL with these patterns!!! I woul most likely use jelly rolls since I have several waiting for a pattern. I could add in some fat quarters from my stash as well. Thank you fir the giveaway opportunity. a fat quarter bundle, or two, or three. I love using all of the pre-cuts. Lately, I have been using scraps from my stash. Great looking book! I have a new layer cake that I would love to use in one of these quilts. Lovely book, I’d love to win! I can’t say just one, I love both jelly rolls and layer cakes equally. I love the patterns, great book! I would have to say all of them. I just keep waiting to find the perfect patterns in which to use them. I think this book fits the bill as I am really inspired by the variety and simplicity of the designs. I would chose the fat quarter bundle to make "The Ties That Bind"! The quilt is quite lovely! I’d use a mix of scraps and precuts, I’ve been looking for inspiration and this book just might be it! A fat quarter bundle, I love those! Would also use it with my personal stash! I would love to use a fat quarter bundle, along with scraps from my stash. I choose a fat quarter bundle, you can make a lot of precursors from them. Thank you. I would use every pre-cut I have, including my stash. The quilts shown from the book are great. Probably fat quarters, since my stash closet is crammed with those. Or perhaps a mini quilt with charms would be cute, too. I love the quilts here! I would love to use a layer cake to create something fun and quick. I would love to use a layer cake. So many beautiful quilts in the book. It would be a great way to use some of my scraps. I would like them all but would choose a layer cake first. I have many beautiful scrap fabrics which would work very well with these designs. I haven’t used precuts as yet. Hope to give them a try. Your book would give me inspiration. As a Senior I can’t buy every book I think would help my quilting. Wish I could ! I love precut. The down size is I have found a great discrepancy in jelly roll cuts, under or over 2 1/2”. I love to use my stash! I would have to add a fifth choice = all of the above. Sue, You have captured the quilting attention of those of us who enjoy "easy". Thank you! This publication is sure to please many stacks of precuts, mine being some of them! I have jelly rolls to sew lovely quilts, layer cakes, fat quarters, and fabric all over the place. This books quilts are great! Fat quarters, jelly rolls, scraps…I have it all and I saw quilts in this book that make me want to delve into my stash…oh, there is hope yet! I have lots of layer cakes that haven’t made their way into quilts yet, so I might start with those- OR with jelly rolls that are also waiting. I would use a Fat Quarter bundle first, because I love that Churn Dash quilt, but then I’d have to get other orecuts out and make some more. All so beautiful. My bin of precuts is overflowing. This book would be helpful in getting it down. I haven’t found a precut (especially jelly rolls) that I didn’t like. I like using the Layer cake. What a neat book!! I should use some of my stash. I have so many pre cuts that I just need to get started and this book would be the ultimate tool to get me going. Definitely a layer cake…the next one would be with my scraps!! I love all the quilts. I would like to make them with scraps or a jelly roll. Thanks for the chance to win. Layer cake (to try to use it up) along with scraps. Fat quarters – great for piecing, applique, pretty much everything! I would love to try pre-cuts as this will get me motivated to start another new project from Easy Quilts! I love the quilts shown for this book. I was going to say layer cake and then I scrolled back through the pics and that churn dash is talking to me. So I guess it would be fat quarters. I would use my scraps. I very rarely bother with precuts because I don’t think they are as accurate as what you cut yourself. I’d try to use my scraps and fabric from my stash first, then head for some fat quarters! Thank you for a chance to win this wonderful book! I would choose the fat quarter bundle. I love her ideas in her new book! I think I would choose my scraps. I do have a couple of jelly rolls and a few double sets of charm squares, but MANY more scraps than pre-cuts. I love the echo churn dash. How clever. Wouldn’t that be spectacular in layers of transparency colours?! I would use a fat quarter bundle. Nice quilts! I have some fat quarters that can be used! I love the quilts in this collection and that they are only one block is fantastic. Thank you for the opportunity to win a copy. Looks like a GREAT quilt book; I would maybe use layer cakes. I love scrappy quilts and have LOTS and LOTS of scraps – so might use those. THANK YOU!!!! I’d start with a layer cake to create a wedding quilt for a newly-engaged friend. Hmmm – bear paws for a fall wedding in the mountains sounds just about perfect! I love scrappy quilts so the obvious choice would be "scraps." What beautiful quilts! Probably a Fat Quarter bundle! Love the Fourth of July quilt! I would love the jelly roll. Such beautiful quilts! Looking For a layer cake pattern. I have two bundles of the layer cake. The fabric is beautiful. First – this book looks like it full of wonderful ideas. What a treat it would be! I have multiple jelly rolls and tons of "scraps", perhaps I could even incorporate some charm packs. Thankful for the opportunity. I would love to use layer cakes – I collect them and never seem to have the right pattern "to use" them. This books sounds like a solution to me! I like to use my own scraps because I like scrappy quilts. By looking at Sue’s quilts, I see that easy to her does not mean big pieces with minimal designs. I like quilts with great pieced designs, not big wide open spaces. She has used great pieced designs with good quilting. I would love to receive her book in this giveaway. Would love to win a copy of this one. Have lots of scraps to use up. I would use a layer cake. I like the quilts highlighted in the book. They do look interesting and at the same time, easy to piece. I have several layer cakes that I’ve never been able to convince myself to break open and cut into but Sue’s book is enticing me to do some slicing. I also love the suggestions for hanging the quilts once they’re done. Some very unique ideas. I love fat quarters for their flexibility. Fat quarters paired with scraps make spectacular quilts. Thx. I would use a jelly roll to create Jack’s Cross. I love the all over swirl pattern they used to quilt it!! I choose my scraps but would love to work with a fat-quarter bundle! Would love to win this book too! I have a layer cake I’ve been round and round with and haven’t found the right pattern. These look like great possibilities! I would love to try a layer cake as I have never used one. I have lots of stash to go with it. Sue’s book looks like a great start for one. Would love to have thanks for the give a way. My bundle of choice would be the layer cake. A jelly roll, it seems theres more fabrics in them. Love a FQ bundle -it leaves you a bit more to play with for accessories, or scrappy binding, or color placement. Stash scraps would also be good. I already have a layer cake ready to be used in one of these beautiful quilts! I’d use a jelly roll and scraps. I am really into layer cakes right now! They’re so versatile! I would start with a jelly roll, then add from my stash. LOVE jelly rolls and layer cakes: so versatile! I admit to loving precuts, but I also can take a precut packet and add in from my stash to make it my own. I use Bonnie Hunter’s stash saving method, so 2.5 and 5 in are easy to keep and use. Jennie Doan taught me to use layer cakes to make BIG pinwheels, lovely! I would love to try my hand with a layer cake! I have not used one before. Your quilts are lovely, each one is beautiful! Thanks for sharing! I have all of the above and if I had the book, I could pick and choose from what’s on hand here….. I have several layer cakes that I would lovd to make into quilts, this is just the book I need! I would love to use one of my fat quarter bundles to make Churn Dash Echo! I really love that quilt, though all are very pretty. I love using pre-cuts. I allows me to use a variety of fabrics that go together and save time. I am admiring that Jack’s Cross pattern so I would need some jelly rolls! I have a lot of layer cakes that I could use! I would live this book. Layer cake would be the one. What great quilts! The question is a tough one – but I think I’d probably go with jelly rolls (or scraps!). I have MANY fabrics in my stash (surprise! ), but am always willing to add more(:-)), so would probably choose to have a layer cake added to my mix. While all of them work for me, if I have to choose only one, it would be a far quarter bundle. I have a fat quarter bundle just begging to be used. Sue’s book is perfect for this. I have purchased both jelly rolls and layer cakes and would love to make some of these quilts. I seem to have an obsession with charm squares! Fat quarter bundle would be my choice. I would use a layer cake. The quilts look great and easy. I would use up the many fat quarters bundles that I have collected over the years. I love easy quilts to make while I’m working on something challenging, that way I feel like accomplishing something!!! Thank you for the opportunity to win this book! I like using my stash, but pre-cuts are very good for quick projects. I would start with a Jelly Roll and add to it with my scraps! I have so many fat quarter bundles but I always find it hard to find a cute pattern for jelly rolls and I love the one pictured!! I have several layer cakes without a plan, so I would start with one of those. I really like a couple of the fat quarter patterns, too. I have a jelly roll and a couple of layer cakes that I’ve been looking for a pattern to use them in. This book would be perfect! Greetings, I’m am loving these pictures. Really scrappy. I would love to use a layer cake to make one of her quilts. I love the double churn dash. I love jelly rolls and have several just waiting for me to find the right pattern! This book would be it! I have a significant stash of fabrics that I like to use. Any ideas you could give me in this book would be awesome!! My scrap bin runneth over. A layer cake plus my scraps would be my choice. I could use layer cakes and some of my stash scrap fabric. I can make 2 1/2″ strips for a jelly roll. These quilts are just my style, they look complicated but are easy to piece. If I’m lucky enough to be chosen as a winner of the book, I’ll be happy with whatever you choose, because I love them all…fat quarter, layer cake or jelly roll, you can’t go wrong. I love that these patterns have a vintage touch! I would go for fat quarters or scraps. Scraps are always my first choice, second choice would be a fat quarter bundle, with a few edits. I have fallen for layer cakes because they are large enough to show the fabric’s print, and they offer the whole collection from a designer’s line. I would love to make the 4th of July quilt! I would love to make one of the quilts and use a jellyroll! Fun! I think I would choose a layer cake and make the vintage bear paw pattern. I would love to use one of my fatquarter bundles that I have been hoarding. I have a layer cake and a jelly roll. Not sure what to do with them. This would give me some ideas. The Bear Paw quilt layout and fabrics are absolutely wonderful. I am also color challenged when it comes to selecting for a quilt and I think your book and tips is going to be just what I need. I love to use fat quarter bundles! A beautiful fat quarter bundle I received as a gift is just waiting for the perfect pattern. I would use the layer cake fabrics, and make a bears paw quilt. Love that design! I have a lovely layer cake that I have no clue what to do with… so I’d use it along with this book! Thanks for the opportunity! This is a tough question! I can never decide between fat quarters layer cakes and charm packs. So I am game for anything! I just love the cold and I would adore any of Sue’s quilt patterns! I love precuts, and the designs in this book are lovely. I’ve never used layer cakes, so I might try something with that. Thanks! I would use any of the precuts. I love all precuts. I would love the layer cake! Then I get a little bit of the best of all the worlds!! I can sub-cut to whatever I want, AND have all the scraps to savour!! I love to use scraps. I love jelly rolls so that’s my first choice but layer cakes are my second. I would use my own scraps. Love the Echo Churn Dash. I have a collection of precuts so I could make every quilt in the book. It would be fun to try them all. While I’ve impulsively purchased pretty much each pre-cut shape there is, I have the hardest time deciding what to do with layer cakes. Yep, layer cakes would be the place to start for me. Thank you for the great introduction to Sue’s new book. The only pre-cut I currently own is a layer cake and it would be great to dive into this book and put it to work. I love all of She’s patterns but I have enough precuts or scraps to make several bear’s laws quilts. Really I’d have to drool over each photo for a bit before finally choosing. I think one of my layer cakes would be a good choice to start. Love all the quilts shown. I am in need of Layer Cake patterns. I’d use a fat-quarter bundle (or maybe a combination of 2). Thanks for featuring this book with so many good ideas. I would use jelly rolls plus scraps- and do I have scraps. love the simple designs with a vintage twist and modern colors. I have some fat quarter bundles I purchased years ago and haven’t used. The quilts in Sue’s book would be a perfect reason to cut them up and use them! Jelly Rolls. I have a few of them and look for the perfect pattern for them. I have a layer cake in need of a pattern. Thanks for the giveaway! I have been collecting jelly rolls. Just waiting to use them! I have several fat quarter bundles and 2 jelly rolls I could use. Looking at the photos I have a a set of fat quarters that I picture making a really nice spring quilt . Please pick me! I would probably use a layer cake – but I’m coming around to the way of the jelly roll! I really like the look of these quilts; they are much more interesting than most quick & easy patterns. LOVE fat quarters, but have lots of stash to draw from as well. Fat quarter bundle! Love the ease of color coordination. I would probably use a little bit of each pre-cut for more of a variety. My stash is soooooooooooo large that the possibilities are endless — in other words never a shortage. I am totally focused on scrappy quilts to the point that I recently started a "Scrappy Sisters" small group in my quilt guild. In my opinion, you aren’t a serious quilter until you start maintaining a scrap stash of fabrics (LOL). This book would certainly add inspiration to myself as well as my Scrappy Sisters. I would combine my scraps with a jelly roll of solids that I have. I like Layer Cakes so that would be my choice. I have all sizes of precuts and enjoy them for the variety they provide. I love using all depending on the project. Favorite, maybe charms and jelly rolls. The fq bundles are great for bigger quilts. This book looks like a winner for using my precuts. Really like the churn dash quilt. i am a fat quarter girl! one to try that churns echo! I like fat quarters the best….but I could probably shop in my stash and get lots of quilts made from that! Since I have so many scraps I would start with them. I like fat quarters for their versatility. Great inspiration. I need to use some jelly rolls. I have too many! Thanks. I think i would use a fat quarter bundle first, then use scraps next. I would like to use my collection of fat quarters. I would use up some of my big stash of scraps! I have a jelly roll that’s ready to be made into a quilt. Personally I love using jelly rolls. Thanks for the chance to win Sue’s book! My quarters are getting pretty fat, and I’m going to have to move them soon. Layer cakes….would like more experience using them. I have several jelly rolls I would like to use! I have lots of fat quarters and large scraps that need to be used. I would use a Layer Cake! I like fat quarters as I usually have some scraps left from them. I have a fat quarter bundle of Blue Sky and I would love to use it to make the bear paw quilt I feel it would look so antique and show off the fabric very well. Thank you for a chance to win. Good luck everyone. I would love to use a fat quatet bundle! They are all wonderful but I think I like using fat quarters and thanks for the chance.. Fat quarters are my favorites! You can get the most cuts from them. I love the twist on the Churndash quilt. I don’t have a favorite pre-cut but would use a layer cake as my first choice. I love layer cakes. But any of these are treasures of inspiration. And fat quarter bundles provide the most versatility. Even though I have a large stash, I would like to use a jelly roll and either a charm pack or layer cake using patterns from this cool book. Thanks for the offer. I have so many of each, I could make the whole book with a different precut and most definitely scraps. I love fat quarters. You can do so much with them. I need this book. It isn’t a want this book. I would give up dinner to get this book! I would give up cooking a dinner to get this book. Aren’t I so great to let my family cook their own dinner? Ha ha. I would make the bear paw first which looks as though it takes charm packs. I want whatever it takes to make the bear paw quilt. Thank you for the chance! Have a great day and an even better week. I have sooo many jelly rolls, I;d like to use some of them. BUT, can I really part with the beauties?????? Would love to try one of these quilts! I would start in my scrap pile — these quilts look like they would be helpful for reducing the scraps a bit. I am just discovering precut bundles and I am so pleased with the concept. Picking colors has always been my problem and so often what I think will look good when laid out in the store does not meet my expectations once it’s put together. Precuts alleviate that disappointment. I like them all but I would say that jelly rolls are my #1 choice. Fat quarters would be my choice. I often make very large quilts so I prefer fat quarters and fat halves! All the quilts are gorgeous but my favorite would be Jack’s Cross so now I need a jelly roll and the book! Hi,like to start with FQB’s for this project!Book looks so neat! Thank You !!! I have a couple of fat-quarter bundles and jelly rolls that I really want to use. There are several gorgeous quilts in Sue’s book that I would love to make. Vintage Bear Paw is first on my list. I would use a fat quarter Bundle to make a quilt. I have plenty of all precut styles, but I would like to use some layer cakes. Thanks for the giveaway opportunity! a layer cake would be my first choice. Jelly roll as it’s been a while since I’ve used that precut. I would head straight to the fat quarter bundles that have somehow been reproducing in my drawer. I am a beginner to quilting and receiving this book would be helpful in supporting my journey. Give me a Fat Quarter anytime. They can be cut into anything. I would love to use a layer cake bundle to make the vintage bear paw. So many beautiful quilts, it is hard to decide which I would make first! I’d chose a fat quarter bundle. 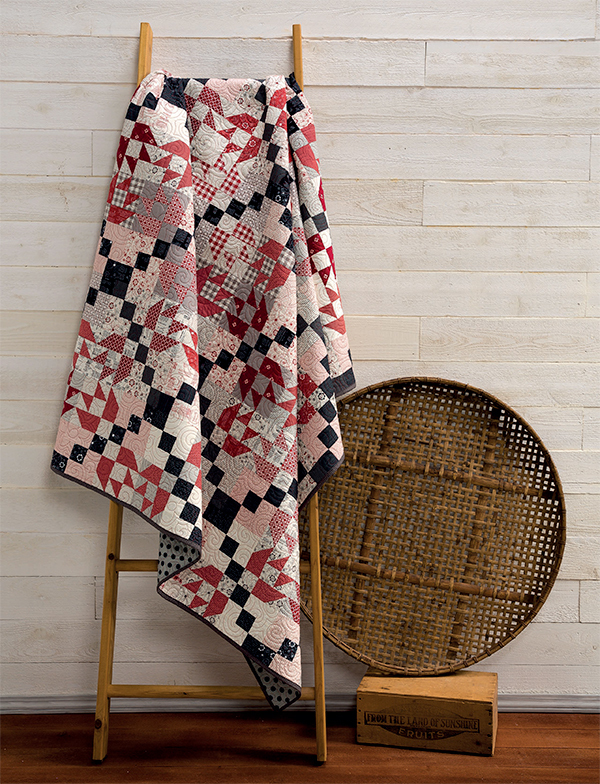 I love the churn dash echo quilt! I want to make her quilts with fat quarters, the most useful precut form. I’d choose my scraps first, then any precuts I have laying around. Love all her patterns. Ah the vintage bear paw-I would surely be vindicated for my previous atemps at patchwork should I make but one of those patterns for precuts. A fat quarter bundle would be great! ‘The ties that bind’ quilt caught my eye, stunning. I like the variety you get with a jelly roll. I seem to use fat quarters the most, so I would have to say a bundle of them would set my heart aflutter. But I think I should stretch myself and try other options. I have several layer cakes that have been waiting for the "RIGHT" pattern. I love so many of these patterns. I choose my scraps…which are yards, and strips mostly. I would likely use a jelly roll or fat quarters – or maybe my scraps! Looks like a great book! Probably my scraps, cause I have a lot to use up! Thanks! I love jelly rolls ! I have so many of all the precut choices. Excited to jump right in on one and all her projects. I toolove the old time blocks. Fat quarters are usually my first choice. However I have a couple of layer cakes and a jellyroll because I just haven’t found the right pattern yet. I think this book would take care of that! Jelly rolls are my favorite. The quilts in the book are so lovely! Each one has such pretty colors and I could look at them all day. As so many have already declared a love for all precuts – hey, it’s all fabric, how can you go wrong?! – I think I’m In love with fat quarters just a bit more. I have a Jelly Roll and some yardage from one fabric line which I’d love to use together. I like the quilts you’ve pictured from "Easy Quilts from Precut Fabrics"! Thanks for the giveaway opportunity! A layer cake! No… A Jelly Roll! No…I don’t know. It just depends on what catches my eye first. I just found a jelly roll that I was really wanting to purchase, but because I didn’t know what I would make with it, I held off. Now I will get it and hope that I can win this great inspirational book. I would love to use a jelly roll. I buy mostly fat quarters, so I am always looking for patterns to use them. Jelly roll b/c I get more colors/designs! I like to see complete sets/designs of fabrics! I love this book! I tell myself I have plenty of books and patterns and I don’t need anymore, then a book like yours comes along. No matter if I win the book or not, this book is joining my library. I have precuts and scraps that would be perfect for the quilts shown. Thank you, thank you for your creativeness. I would use my scraps -I have tons of them! I’d use a layer cake…I love them! I would use a layer cake to make Churn Dash Echo. Love that quilt. I have all of those precuts but wwill probably start with a layer cake first. I would love to use a fat quarter bundle! I’ve never bought any of the precuts listed, although I have won FQ bundles. I like all fabric as my closet will attest. I already have plenty of scraps, and should I win the book, I could get started right away! Since the Layer-Cake lovely Vintage Bear Paw quilt caught my eye, I will say a layer cake. All the quilts are wonderful though, so I could use many bundles. Either a fat-quarter bundle or a Layer Cake. My go to is a fat quarter bundle. The book looks like it has so many beautiful patterns. It would be a great one to have around! A layer cake! It’s so versatile and I have a few floating around waiting on a good project. Thanks for the opportunity! I’m a layer cake gal! Thanks for the opportunity to own this book. Would love to use a jelly roll on a beautiful quilt. I choose my scraps whenever possible. I’m trying to "whittle" down! I WOULD USE SOME OF MY SCRAPS. Choose my own scraps. I’m planning on making a quilt for my youngest grandson. This would be a great start!! I have all of the pre-cuts plus fat quarters so I would use them all with this book! 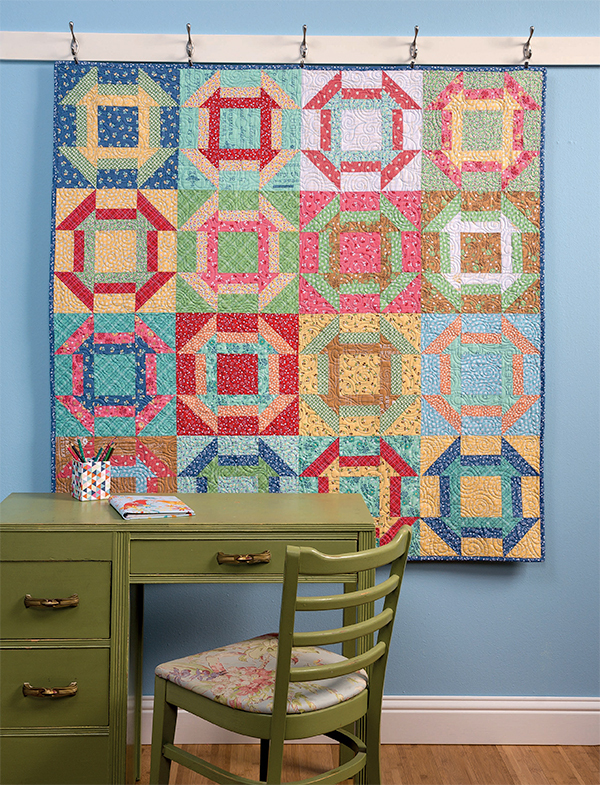 Love the churn dash quilt. I would like to delve through my scrap basket to make it. Fat quarters are my go to. Actually any fabric precut or scraps from my stash are fine by me! Thanks for the giveaway. I have quite a few jelly rolls, so would use those, and my scraps. I would use a layer cake. I love Sweet Jane’s quilt patterns! She’s new book catches my attention. I would use fat quarters for a project. Thanks for the chance to win a copy of the book. Id live this book and use a layer cake to make my first. I choose layer cakes. I love the 4th of July pattern. I have a layer cake of batiks. I would love to use a patriotic layer cake to do the Fourth of July quilt! I donate quilts to a local veterans organization- and this would be a great pattern for them! I would choose to use my scraps. I love the scrappy look! 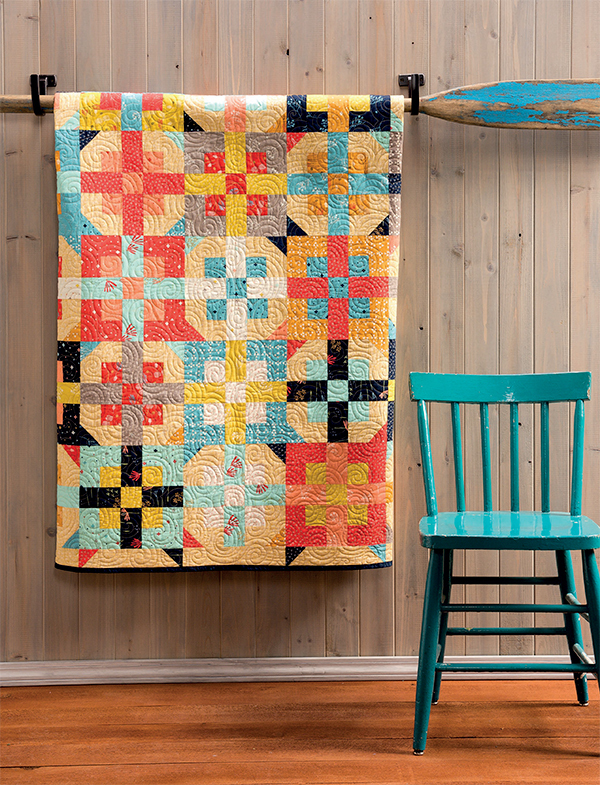 Love the double churn dash quilt!! A jelly roll or my own scraps. Any of them. But if I had to choose, probably fat quarters. A layer cake! That’s what I usually buy when I want the entire line. Love the look of all the Quilts, I would like to try a layer cake and have some fun! I have a stack of Layer Cake’s looking for a pattern and a rotary cutter! I have a few layer cakes I need to use, but I would also like to use my stash on some of the quilts, too. I have a few of each of these pre cuts resting in my cupboard, along with quite a good supply of meterage. This book would help me make room for more fabric, so I would choose to make one of these quilts with a jelly roll that I have been keeping forever, and back it with some co ordinating meterage. Win win! I’m partial to layer cakes. I am "ga ga" over the Churn Dash quilt. Love the way it displays the variety of color. Very inspiring and such a lovely wall hanging or table topper. If I was to choose, I would choose to make the quilt with a Fat Quarter bundle. I love them all and buy all! Hmmm, I have several jelly rolls and FQ bundles just waiting to be cut into! Great book! All ore it’s are wonderful! Which I use would depend upon the project. And of course I’ve done some really good things using scraps! I have some of all three sizes, but then again I have scraps in bins just waiting to be used. So this book would be an inspiration for sure. I would like to make a quilt using a layer cake. Please enter me to win a copy of your book. I would use any and all that was called for. I started collecting precuts quite awhile ago and have a "stash" of scraps and larger pieces as well. Being a beginner quilter, this book is right up my alley, and I would love to learn from it! I have a beautiful jelly roll that i fell in love with the colours… i haven’t opened it yet & love the Jack’s cross quilt….. if I win the book i will make it! I love them all but would choose a fat quarter bundle. I’ve got them all, just need the book! i have both jelly rolls and layer cakes. From what i see these beautiful quilts would look amazing using either! I have way too many jelly rolls and need new ideas on how to use them up! I have several lovely layer cakes that I would enjoy piecing into your great vintage-looking quilts! Layer cake! I have not made a quilt with a layer cake yet. I love love love picking out fabric! So I would use scraps or go shopping for fabric. Even though I have a lot of precuts already! I have jelly rolls and layer cakes i would love to use on these beautiful quilts..
All the different kinds of precuts are thrilling, but since I have to choose I guess it would be the fat quarter bundle because it is the most flexible. While I use all kinds of precuts, I find that fat quarters are the most versatile for the style of quilts that I make. A fat-quarter bundle. I could make multiple quilts with it and also mix the scraps in with my own. Looks like a lovely book. I would start with a jelly roll. I’ve never bought or used a layer cake — maybe this is my opportunity to try one! I love to work with layer cakes. I would use a layer cake bundle, then I could 5” squares and 2 1/2” squares. Layer cakes are my thing. Especially like the Vintage Bear Claw! Some of each? This could keep me busy for a while! Jelly rolls are my absolute favorite pre-cut to work with. Not only are the coordinated fabrics fun to play with, but just the name alone makes my mouth water! My stash and scraps are waiting for good projects. A layer cake. I have several and would love to cut into one. I choose scraps…always scraps. I think they add to the vintage look. All the quilts in this book would be fun to make ! My first choice would be to go to my scraps. But I have a couple of jelly rolls that have been waiting for just the right project! This book might have just the right quilt for them! I have a few Layer Cakes that would be perfect for this book! I love the quilts that you have shown! I would love to try her patterns using jelly rolls. Jelly Roll! Although I do have some Layers cakes I need to use! The book looks so nice, great colors in the quilts! I love layer cakes!! i have a few to use up! I would say fat quarters – although I have so many scraps I could probably complete one from that. I would love to win the book and find out! A layer cake. Great book! Love the quilts, have lots of scraps and jelly rolls to make several of these great quilts. I would probably start with a jelly roll but I like the idea of using up my scraps too. I love using layer cakes because you get a lot of variety. I also love using scraps……so much fun either way! Fat quarters of course! Absolutely loved the pictures from the book. Hopefully I will find the book to make the churn dash one. I would choose Jelly Rolls. I have not tried them yet. I have so many amazing fat quarters, and I need to use some of them up. I can’t wait for this book to come out! A jelly roll. The quilts are so bright and fun! I love precut! Layer cakes and jelly rolls are my favorite. I’d have to go with layer cake for this one. Just love that bear paw quilt. What a lovely book! LOVE all of Sue’s patterns… a layer cake is my favorite precut! I’d love to use up some of my scraps to make one of these beauties!! What a great-looking book! I’d like to try a layer cake quilt. good use. What a great looking book! I’d definitely choose a fat quarter bundle – thanks. I would love to use a jelly roll! I would like to use a layer cake or jelly roll. I love precuts and her quilts are beautifull. I have mostly fat quarters on hand, but I enjoy using layer cakes and jelly rolls, too. These quilts are great! Fat quarters are my favorite precut.. they’re very versatile. I love the quilts in this new book. I have large quantities of all pre-cuts so book will cover them all!!! Fat quarters are fun because you have more fabric to play with. You could also try another pattern from the book with the same fabric. I have many jelly rolls & layer cakes to use. This looks like the perfect book to help me. I would like to try one of her quilts. I’d like to use a fat-quarter bundle! Awesome book! I would like to try it with a layer cake since that would be a new experience for me. A Jelly Roll and a matching Layer cake, love the patterns. I would use a fat quarter bundle. I would love to start out with layer cake bundles, they can be cut down to make other blocks in a quilt. Oh, I would love to have this book in my library. The July 4th quilt would be on my to-do list. Lots of all to use but layer cake is my fave! I have a couple of layer cakes that I can already invision in those patterns. Thanks for the inspiration and guidance so I do not have to think so hard. Just sew and have fun. A fat quarter bundle…and I have the perfect bundle for a couple of her quilt designs. I’d probably lean towards a layer cake – but the truth is that I have so many scraps, I should probably really make something from those first! The Layer Cake because it has so many different samples of fabric that can be cut into various sizes to make several of these beautiful quilts. The fat quarters will give you larger pieces of fabric but you will not have the variety that I see which makes many of these quilts so gorgeous. I would enjoy this book if I am chosen. Thank you. bundle to make a beautiful quilt. Putting this book on my wish list for sure. I would use my scraps! I would Use the layer cakes I have first and then the jelly rolls I have collected. The patterns in the book are beautiful. A fat quarter bundle would be wonderful to use for one of her projects. I have certainly been inspired just by the pics. I love my layer cakes. I use fabrics from my stash. Great looking book. I just did my first jelly roll quilt and really enjoyed it. I’m willing to try the others too. I’d love to make a quilt using layer cakes. I haven’t tried them yet. I love Sue’s patterns. I’d love to make one of them for my grandson. I have several layer cakes that called my name and have no idea what to do with them. They are so pretty and they need to be made into a quilt not stuck in a tote. I also have some flannel scraps that need to be used in baby quilts and donated. Thanks for this opportunity to win your books! FQ Bundle, this book looks soooo good! Layer cakes offer so many opportunities! Can’t wait to get my hands on this book!! Oh my goodness! What beautiful quilts! I’m especially drawn to the red, white and blue – so pretty. I would love to use a fat quarter bundle to make one of her quilts. I would choose a layer cake. I love to use layer cakes for my quilts, You have so many options for your favorite quilt pattern. I have all three types of these precuts in multiples. I would probably let the quilt I was most drawn to dictate the pre-cut for the first quilt I make out of the book. Although with the number of FQ’s I have, not necessarily in a bundle, it might be fun to pull a "bundle" out of my stash to make a quilt. I would choose a fat quarter bundle. I’d love some creative direction for my scrappy bundles! I’ve never used a layer cake pack, but it seems like there would be a lot of options for this size. I’m drawn to the swirl of color and pattern in jelly rolls. I would love to expand their creative potential. I would use a layer cake and a jelly roll to start working on the Vintage Bear Paw quilt. I choose my scraps because I already HAVE all those sizes IN my scraps. Layer cake! Thanks for the chance to win this book! i have several fat quarter bundles i would use for one of these quilts. I want to use a layer cake. Beautiful quilts. I am a scrap lover. Digging into to scraps would be fun for one of these quilts. Such pretty Quilts. Since I have way more scraps than precuts, I would start there. If I need to add to it, fun!! I would love to be the winner of a fat quarter bundle! Love the fabrics featured and I would definitely reach into my stash to add to the quilt!!!! Thank you! I would love to have this great book and I would use a jelly roll or my own stash which defently needs to be put to good use…such as one of these quilts from the book. Thank you for giving me the chance for a special surprise. I have never used a layer cake, so that would be my choice. I’m sure I can supplement it with fabric from my stash for one of quilts in her book. Oh, WOW, I can see my scrap pile going down like crazy with these patterns!!! Would luv to use a layer cake! I would make the Layer Cakes-the Fourth of July quilt. I love all Americana quilts. A fat quarter bundle would be perfect! 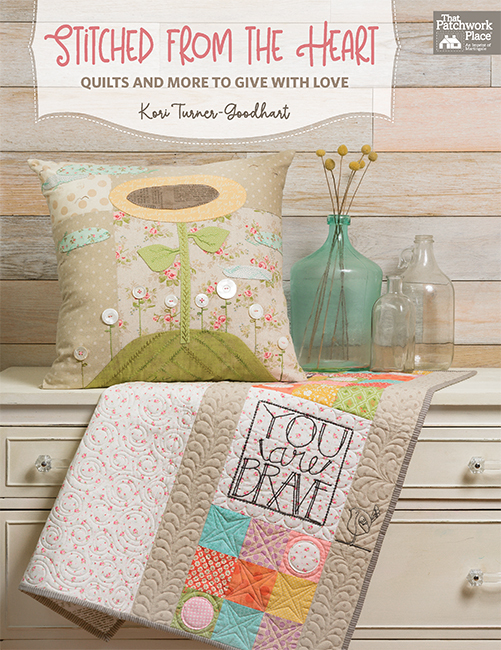 If I have a choice, I’ll always take a FQ bundle, because I like to make bed-sized quilts. I would love to use a jelly roll and make Jacks Crosses! Looks like a great book! I choose my scraps! to try the patterns in Sue’s new book. What a great book this is! I see several quilts I would love to use some beautiful fat quarter bundles on!! I love to use jellyrolls & layer cakes in my quilts. Have taken classes at my quilting store to use both & have made several quilts after that. They both offer so many possibilities to making beautiful quilts. I do enjoy using all pre-cuts, but really like the fat quarter quilts in this book. Great designs. I love using scraps. I like this collection of designs as they are the style I love.! I love jelly rolls and would put them to good use with Sues book. I have an addiction to fat quarter bundles!!!! A layered cake and jelly roll. A fat quarter bundle, I love the versatility! As I have a box full of scraps from the layer cakes, jelly roles, and fat quarters that I’ve used, I think these quilts would be PERFECT for using these scraps. Then I would have to fill up my box again, so it’s shopping for new cakes, rolls, and quarters! What a perfect world! I have several jelly rolls that I can’t decide how to use. These quilts would be perfect! I would say fat quarters and I absolutely love The Ties That Bind! I have a couple (actually a few) jelly rolls that are dying to be used in a quilt. I have found great uses for a Layer Cake, now that I have found out how make Half Square Triangles with them, I can now branch out with the patterns I choose. Fat quarters for me! Love these easy looking, but pretty quilts! I would use a Jelly Roll! Thank you! I would love to use a jelly roll… don’t have one and have never used one. This book would be great inspiration! 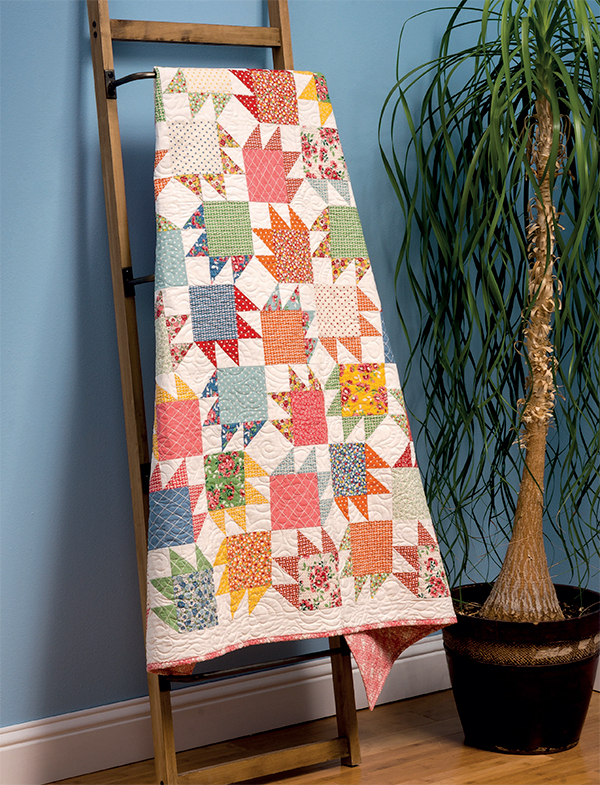 I would use scraps and a Fat Quarter bundle….beautiful quilts for all the fabric we collect! I have no bundles of pre-cuts but I AM beginning to acquire a lot of scraps for my stash, so that’s the way I’d go with this new book. Thanks for another generous giveaway. I usually use FQ’s when I sew, but I have some of the others that I would like to use. I have so many fat quarters, so I would love to use as many as possible in a quilt. But, I have two layer cakes as well, so I think I need Sue’s book. Thanks for the chance to win it. I have collected quite a stack of fat quarters, think I need to start using them. I have some jelly rolls! A fat quarter bundle, love the flexibility. I am in love with the churn dash echo quilt, so I guess fat quarters. Don’t need to buy a bundle, I have lots of them already. I love precut because I have spinal problems and using precut allows me to be able to still quilt and not have to stand for long periods doing the cutting. I would use a layer cake and fill in with some of my stash to avoid a "matchy-matchy" effect. Fat quarters are abundant in my stash so that is what I would use. I love them all! But if I had to pick just one I would have to say jelly rolls. This looks like a great book to use for that! I like to use a Layer Cake because I get the full range of fabric and can cut it into 2 charm packs and a jolly bar, or 4 charm packs or anything in between. I have to have this book, it’s calling my name! I would love to make the Fourth of July quilt using the same layer cake she did! The colors are awesome. I have a layer cake I’d love to use. I have some jelly rolls that I need to use in a quilt. This book would be a great inspiration for me. I have all types of pre-cuts and a big stash. I need this book. I have a whole stack of jelly rolls that could be used in these patterns, but I have one really pretty layer cake that would definitely be first! It is so hard to chose which would be my top choice so maybe I just need to make one using each one. I have plenty of precuts and scraps so….. Since I never indulge in such luxury, I’ll say a FQ bundle! The Churn Dash echo is my fave so i would say a Fat Quarter Bundle. Great variety in options. I like that book covers more than one precut size. Scraps! Remnants are my favorite! A FQ bundle to start. Beautiful quilts. I really like all you can do with a layer cake. Need to use what I have…which includes everything but layer cakes! Great book!!! Layer cake, I have one on its way to me through the mail and am excited to make something with it when it arrives but overwhelmed choosing a design. I do like to pick my own scraps, that’s what’s so fun about it. I’d use a layer cake and then add more fabric from my scraps. Looks like a great book! I love all precuts but fat quarter bundles are my favorite. Thanks for the opportunity to win! 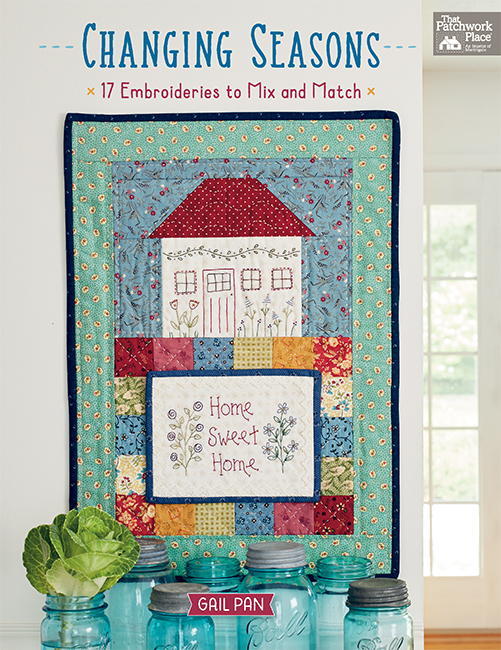 The book has great quilts — love the bright colors. I love playing with jelly rolls. Sue speaks my language, simple and uncomplicated. I would probably choose fat quarter bundles as my choice. I cut fairly accurately and they have the most usable fabric. Fat Quarter Bundle, then I have scraps to make another gorgeous quilt. Thanks. Fat quarters supplemented by my stash. I like mixing things up! I need to use my jelly rolls. Looks like the perfect book. Generally I like to use fat quarters and my scraps since they can be cut into strips and squares. However, I do love layer cakes and jelly rolls for quick projects. Ok-so I’m a fabric addict! And no borders? My kind of quilt! When I buy fabric, I usually buy fat quarters. I have many fat quarters to pick from to make one of Sue Pfau’s quilts. I’d love to use a layer cake. I’m a diehard prewasher and layer cake squares wash up well. I’d make that bears paw quilt at the top of the post – love it!! I love precuts. Currently making a quilt out of 2 layer cakes. I love layer cakes. Fat quarter bundle, love her color combos! I would choose my own fabrics as I am over-run with them! Really like the Churn Dash echo-may be in my future! I would hopefully be able to use one of my many fat quarter bundles. I love those and have a bunch of them. Love the simplicity of her one-block designs. Certainly makes some gorgeous quilts! Thanks for the chance to win! I have so many scraps, I would definitely start with them! I love to use layer cakes. Thanks for the chance to win- this looks like a fun book! I would like a fat quarter bundle, please. It would go with so mamy vintage fat quarters I already own and drool over! Who could possibly choose which to use? I try to use them all, but they still overwhelm me with choices. I do like EASY and that way I can knock out a quilt much faster. Vintage quilts are what I am drawn to primarily…vintage and very scrappy. Great quilts in this book! Thank you for this opportunity. A fat quarter bundle. Thanks for the opportunity! I would choose a layer cake, since I have more of them. I could also use jelly rolls or charm packs. Thanks. Oh I think layer cakes!! I’d love to have this book. Looks fantastic! Love getting different designs to use up my stash of beautiful precuts. I like to pick blocks from my own stash–finding the right color combinations is a fun challenge for me. I will use my stash. I did cut some stash in strips and blocks, waiting in a box to be used in a nice quilt. A fat quarter bundle. Thanks for a chance to win this book. Looks great!! You have the best giveaways. I make an average of 40 quilts per year, most of which are donated to charities, so you can imagine I sometimes run out of inspiration to design and would just love some help. This book looks like it would fit the bill. Thanks. I have a fat quarter bundle that is just begging to be opened to make a quilt from Sue’s book. One of the pictures above has already inspired me! Thanks. I have a great collection of fat quarters. I think I need to use some of them instead of just admiring them. I have several pre-cuts, jelly rolls, 10″ squares, and fat quarter bundles. This book would really help me use them! I have a jelly roll or two 🙂 that would be perfect! Jelly rolls are the precut I have the most of, so I’d like to start with some of Sue’s jelly roll patterns. Her book would help me make a dent in my precut stash! It’s a fat quarter bundle for me! I’ve used all the precuts at one time or another but I’m leaning toward the fat quarters. The quilts are beautiful. I love using Jelly rolls because there are so many different things you can do with them! I have a few layer cakes waiting to be turned in quilts! I love working with the fabrics in my stash collected over many years. Layer cakes as I find them easy to work with. I would use a great pack of fat quarters designed by a Canadian fabric designer! I love fat quarters but have started to dabble with layer cakes. They’re a great size. I usually choose my own scraps. I like certain patterns in the materials that I make my quilts from. Sue’s book could be the inspiration I need to try layer cakes, jelly rolls or fat quarters. Thanks for the giveaway. I’d like to use a layer cake to make her blocks and quilts. They are so lively. Hi, I just started quilting in July and have some fat quarter bundles that were calling my name when they were on sale, would love to decide on a pattern for them! I’m a visual learner so this new book would really help me out. Jelly roll or fat quarters probably. What a great book! I would love to use my fat quarters to make The Ties That Bind. I would go with a fat quarter bundle. I have tons of fat quarters that I would love to find a quilt pattern to go with them. I’d like to use a fat quarter bundle. I have lots of fat quarters, some jelly rolls and a few layer cakes. I’m ready to start. Love the idea of using precuts for making quilts. I’d either use a FQ bundle or a layer cake. I have a fat quarter bundle of fall fabrics that I would love to use, to make a quilt from your book! I would love to use a fat-quarter bundle in one of Sue’s quilts! And I have one that I’m looking for the right quilt to use it in! My stash includes both layer cakes & jelly rolls, so I’d love the book to for each! I love layer cakes and fat quarter bundles. They are what I have the most of. Sue’s book sounds like one I need. i would use a fat quarter bundle. her quilts are beautiful. Layer cake and then start using my stash. I have precuts in all sizes but my favorite is the fat quarter so I would start with that. I have a jelly roll I would love to use. I have a couple jelly rolls and charm packs that I could use. I love Jack’s oar. Jelly rolls, they look so pretty on the shelf and then I’m never sure what to make with them. I have a layer cake hat would just love to be in one of these Easy Quilts. Jelly rolls. Love Sue’s color combos! 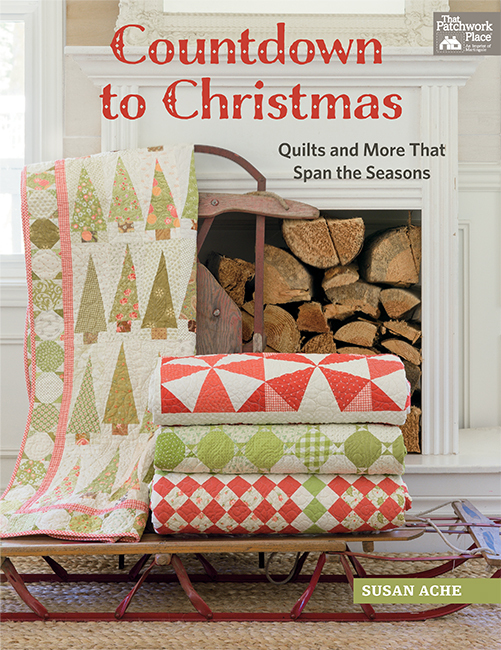 I would love to make all the quilts in this book! They are all beautiful. Have some jelly rolls just,waiting for a book like this. Love the quilts in this book. I love fat quarter bundles! Fat quarters! Plus my stash, which is mostly fat quarters! I love the different quilts with pre cut fabric. It makes everything so much easier. Jelly rolls–I love them, but I hardly ever use them! I love ALL pre-cuts and have many of each on my shelf so this book would be very beneficial to me. Love all of the quilts you showed in this post! I love sewing with any type of precut. Sometimes it’s a challenge but always worth it. I love a jelly roll. I find so many ways to use the strips. Quilts, pillows, table runners, tree skirts and wall hangings. I have even mixed and matched left over strips and created new color combinations. I love charm packs and layer cakes, too! I love fat quarters so I’d use them for a quilt. I’d love to learn to use more pre-cuts. Oh My.. I have to pick just one.. when I in fact use all of the choices.. I have several Layer Cakes I could use.. or maybe a jelly roll.. or how about one of my fat-quarter bundles. But then I could just choose my scraps to make my own scrappy design. I choose my scraps! I have some vintage and antique fabric scraps that came from my grandmother and great grandmother. I’m sure my aunts had their 30s dresses made from them. I would combine them with a nice off-white fabric to make one of these quilts. I think I’d start with a jelly roll, but there are so many great patterns, no doubt I’d be inspired to make more! I have never used layer cake so would love to try ! A fat quarter bundle, and then use some of the layer cakes that I have accumulated. I love fat quarter bundles and would make The Ties That Bind. It looks like such fun! I love the Bear Paw! Some layer cakes would be great for it! mixed in with some of my own scraps! I would use fat quarters as they’re the only precuts I buy. I like to collect FQs, either bundles or my own mix. I have all three, and lots of scraps, so I really need to try several! I’d use a jelly roll! I really love working with precuts but scrappy are my favorite quilts. I just love the scrappy Bear Claw Quilt in your book. I would love to win your book. I have a number of fat quarter bundles just waiting for inspiration. Think I just found it! I would try the Vintage Bear Claw – it’s so beautiful! I would, however, use my own scraps, only to start to cut down on the stash! I’m a firm believer of waste not want not, so I would be attacking my scraps along with a layer cake or two. I would like the Jelly Roll. I’d use fat quarter stacks: I seem to have plenty of them!! 🙂 Thanks for the chance to win this book: it looks great! Layer cakes are so versatile. I have a couple waiting to be used!